Ngadirojo village is a village located in Ngadirojo, Pacitan. It took approximately 1 hour and 30 minutes from the center of Pacitan to reach this location. The majority of people in this village are farmers and ranchers. Nevertheless they are already aware of the media in which the majority of people in this country own and able to operate a smartphone. However, a lot of people in Ngadirojo who do not know the impact of the various communication devices they own it. In this study, researchers used a qualitative method with descriptive approach to conduct direct observation and interviews with some of the community as well as with devices Ngadirojo village. The results of this study showed that most people in the Ngadirojo village not know of the impact caused by the use of smartphones. They just use it as a medium to spread and receive information as well as entertainment without any filtration of the contents in it. If people can understand this then they will be wise in using the smartphone so that it can minimize the negative impacts caused by the development of this communications technology. RIZQI, Muchamad; PRADANA, Bagus Cahyo Shah Adhi. Literasi Dampak Penggunaan Smartphone Bagi Kehidupan Sosial di Desa Ngadirojo, Kabupaten Pacitan. Communicare, [S.l. ], v. 5, n. 2, p. 15 - 30, jan. 2019. ISSN 2502-2091. 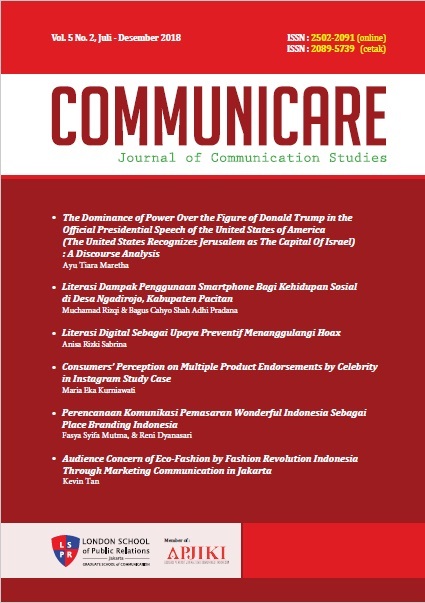 Available at: <http://journal.lspr.edu/index.php/communicare/article/view/35>. Date accessed: 18 apr. 2019.